← Parmigiana di Melanzane – One of our very special specials! Costanzo wows us with his mussels! Firstly I must apologise for featuring, yet again, another fishy dish in our Delicious Dishes, we just love fish! Today we’re showing off our mussels, of the mollusk kind of course! 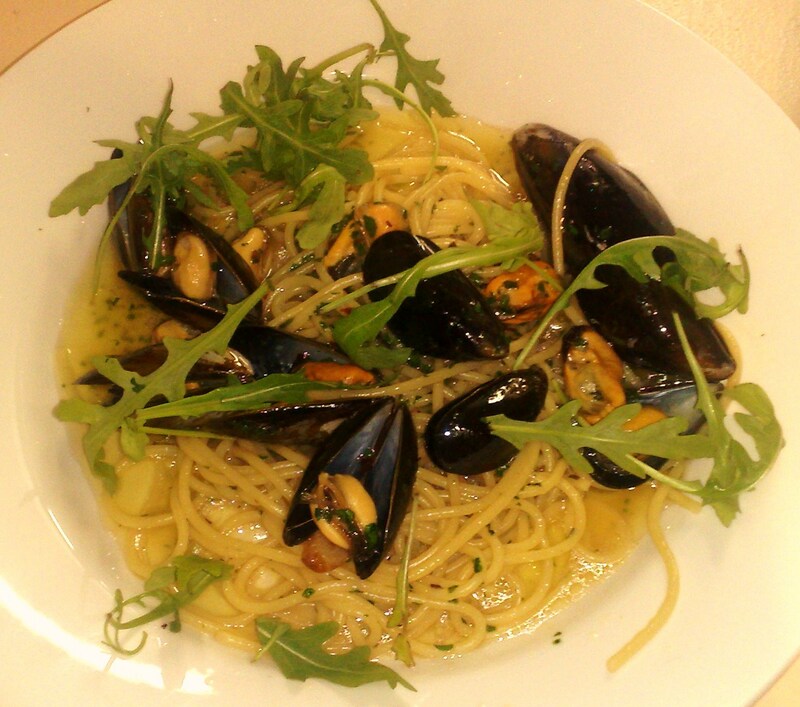 In Italian this dish is called Spaghetti con Cozze, in English Spaghetti with Mussels. Not featured on our A La Carte Menu, Costanzo will prepare this dish as one of our Specials when he can acquire the very best, fresh mussels from the market. The mussels are cooked in their shells with garlic, oil, chilli and white wine and tossed with spaghetti al dente, finished off with a garnishing of parsley and rocket, it’s ready to serve. Best served with our hot Italian bread to mop up the juices, a bottle of chilled white wine and some good company. What more could you want? As with our other “finger” food, we will provide beautiful stylish bibs free of charge and a finger bowl to clean up after your feast. So, if you are a fish fan, this is a dish well worth trying if we have it on the menu when you visit. If it’s not on the menu, fear not, there will be something equally delicious to replace it! This entry was posted in Delicious Dishes!. Bookmark the permalink.